The Japanese did not have a good handle on tanks prior to WWII, and sadly for them never solved that problem during the course of the war. 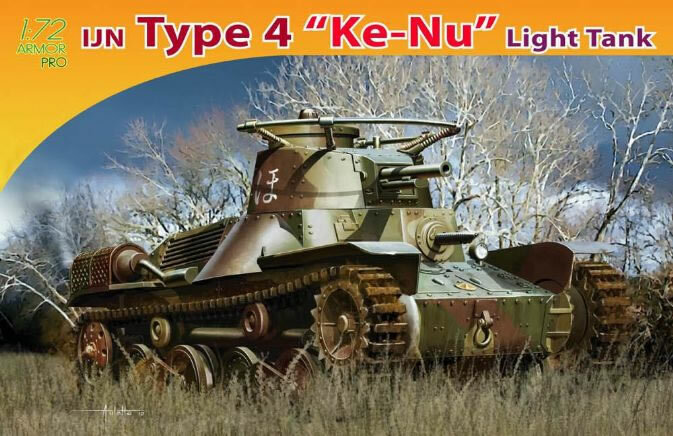 The Type 95 “Ha-Go” seemed to be a good vehicle when attacking Chinese peasants, but proved close to useless in combat with US forces later in the war. As a result, in 1944 they modified the Type 95 to take the original turret from the Type 97 Medium Tank with its short 57mm gun to provide better fire support. Six prototypes were built and 100 were converted, but they provided little impact on future events. One captured in Manchuria (“Manchuko”) by the Soviets is the sole surviving example. DML has now done the same thing – they have offered their nicely done Type 95 kit with the complete sprue from the Type 97 with its original turret. (Since models rarely have to match their prototypes, they use the same turret ring and opening so it is a drop fit). The result is an imposing sounding number of parts, but fully half of them are not used. As with the previous kit, DML has used its slide molding technique to mold the idlers and return rollers in single pieces with holes in place and simple but effective bogie assemblies for the running gear. The model comes with an etched brass muffler guard (MA1) which is shown, but the rest of the brass parts are not covered in the directions. They appear to be the brass parts from a Type 97 that just “came along for the ride”. The DS tracks on the review sample were noted as being 130mm in length but measured 129mm, so some slight stretching will be needed prior to assembly. Finishing directions for a single vehicle are provided: 19th Tank Regiment, Kyushu, 1945 (tricolor with turret symbol markings). A tiny sheet of Cartograf decals covers the symbols, but while not shown there are several others on the sheet which are given as options in the directions. Overall this is a neat little tank conversion and DML has done a nice job of capturing it.